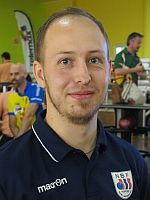 Although there were no changes at the top of the leaderboard in the Storm Lucky Larsen Masters Saturday, several competitors found their way into the top 10 at Baltiska Bowlinghallen in Malmö, Sweden. 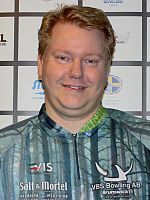 Two-time European Bowling Tour winner Pontus Andersson (featured photo) of Sweden produced the biggest six-game series of the day to jump from 66th to sixth place with 1347 total. 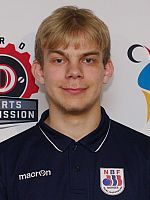 The former world youth champion averaged 224.50 and posted games of 247, 202, 242, 204, 238 and 214 in squad 12. Squad 11 leader Thomas Larsen (left) of Denmark, who previously moved into fifth place, fell one spot to sixth place with 1344. Jimmy Mortensen (right) of Denmark, who posted 1451 in squad 4, an average of 241.83, continued to lead the 225-player field from 14 countries. 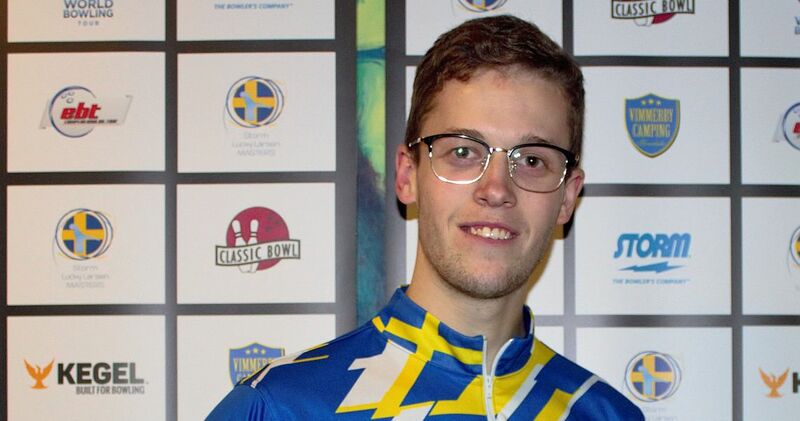 Mortensen, who won his lone EBT title in the Norwegian Open 2015 by Brunswick, was followed by four Swedish bowlers, Jesper Svensson in second with 1411, William Svensson in third with 1407, Mikael Roos in fourth with 1363 and Martin Larsen (left) in fifth with 1354. 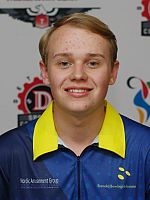 Rounding out the top 10 was 2018 World Youth Doubles champion Alfred Berggren (right) of Sweden, who was next to Larsen in squad 11, with 1320 and an average of 220. 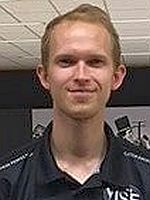 Rasmus Edvall, runner-up in squad 12, missed the top 10 by just one pin finishing the day in 11th place with 1319. 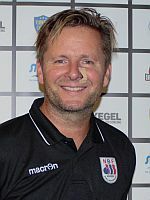 The last squad on Saturday, 13th overall, was dominated by Norwegian bowlers. Five-time EBT titlist Tore Torgersen (left) led the way with 1258 but missed his high score by 26 pins to sit in 15th place with 1294. Tor Inge Jansen (right) had 1249 to move into 30th place, while 2018 World Youth champion in Singles, Georg Skryten (below left), took 36th place overall with 1237. Loke Molander of Sweden currently holds the 46th and last place to advance from the overall leaderboard with 1222 and an average of 203.67. Qualifying continues on Sunday, September 2, with squads 14, 15 & 16 scheduled to start at 10 a.m., 2 and 6 p.m. Central European Summer Time (CEST). 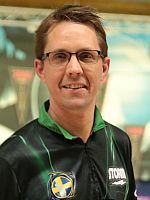 The Storm Lucky Larsen Masters is the 9th stop of the World Bowling Tour 2018 and the 10th stop of the European Bowling Tour 2018. The tournament is a WBT “tier 2” event and second and last EBT “platinum” event this season, the highest of the five EBT categories (platinum, gold, silver, bronze and satellite). The second Storm Lucky Larsen Masters will be held from August 25 to September 9 at Baltiska Bowlinghallen, a 22-laner in Malmö, Sweden and offers an increased total prize fund of 1.038.000 Swedish Kronor (SEK), or approximately 98.600 Euro, with 150.000 SEK (€14.250) going to the winner, 110.000 SEK to the runner-up and 80.000 and 60.000 SEK to the third and fourth place finishers, respectively. Low to cash is 60th place worth 3.500 SEK or 333 Euro. All rounds can be watched live on SolidSport, featuring four different cameras covering 16 lanes. For more information, click here. Qualifying of the Storm Lucky Larsen Masters (six-game series, unlimited re-entries) runs from Saturday, August 25, through Saturday, September 8, with the last qualifying squad 33 scheduled for 8 p.m. Central European Summer Time (CEST). There will be no Desperado Squad this year. Women receive 8 pins handicap each game throughout the entire tournament, an equality handicap provided to women in all EBT events. Maximum score is 300. Total 60 players will advance to the finals on Sunday, September 9, including the top 46 qualifiers, top 7 from an “Early Bird” competition (squads 1-16), top 2 senior bowlers (born in 1968 or earlier), top 2 U21 bowlers (born in 1997 or later), all not among the top 46, plus one player each from Turbo 4, 5 and 6 ranking (highest scores in game, 4, 5 and 6 (no extra entry fee required). The top 8 qualifiers receive two byes for the finals, while qualifiers 9-33 get a first-round bye. The other 27 players bowl four games from scratch before the field is cut to the top 11 who join qualifiers 9-33 in the second round featuring another four-game block from scratch. The top 16 meet qualifiers 1-8 in the third round to bowl eight games starting from scratch. The top 4 advance to the stepladder finals. The World Bowling Tour 2018 currently features also twelve stops, one each in Germany, South Korea, Sweden, Thailand and Hong Kong and seven stops on U.S. soil. More events may be added, at least 3 months’ notice provided. The Storm Lucky Larsen Masters is the 9th stop of the WBT 2018 and one of the tier 2 events this season. WBT tier 2 events award bowlers with four times the number of base WBT Rankings points (tier 1 six times and tier 3 two times). Due to an agreement between World Bowling and the Professional Bowlers Association (PBA), World Bowling Tour tournaments will award a PBA Tour title if the winner is a PBA member (who doesn’t accept handicap pins). However, when an event is U.S. based and not a PBA event (such as the New Mexico Open), no PBA title can be granted. The 10th stop of the 2018 World Bowling Tour season is the WBT/PBA World Bowling Tour Thailand, a tier 2 event, which will be held Sept. 22-28 at Blu–O Rhythm & Bowl Ratchayothin in Bangkok, Thailand. Total 60 players will advance to the finals on Sunday, September 9, including the top 46 qualifiers, top 7 from an “Early Bird” competition, top 2 senior bowlers, top 2 U21 bowlers, all not among the top 46, plus one player each from Turbo 4, 5 and 6 ranking.